Yesterday I started what I hope is an interesting and thought-provoking series that addresses the issue of how we view and manage the process of sports talent development in young children. I looked at a recent study of Danish elite and near-elite athletes where the authors concluded that “There is no delay in the athletic development that cannot be made up later with late specialization”. Practice trajectory leads to performance? So there is a clear difference in practice trajectory, and it’s tempting to say that this is linked to a difference in performance trajectory (in that they end at different levels). However, that may not necessarily be the case, as I’ll discuss below. So today, I want to give my thoughts on the above graph, and give some possible reasons why the graph looks like it does. I believe these potential solutions have some pretty significant implications for how we view “talent” and “hard work”, and whether champions are born or made – it’s unlikely to be as simple as we think! First, however, I have to clear up the definition of specialization and suggest a new name for the Danish study, which made a conclusion that I don’t believe is supported by their data. That study[cite source=pubmed]21401722[/cite] was called Late specialization: the key to success in centimeters, grams, or seconds (cgs) sports. In my opinion, what the data suggest is that the paper should have been called “Delaying high training volume: the key to success in cgs sports”. That’s because they actually found NO DIFFERENCE between elites and near-elites with respects to the training time spent on other sports – the elites did 63 months, the near-elites 62 months. So the conclusion that delayed specialization predicts success doesn’t hold up – it has little to do with specialization and a lot to do with training volume. This is important, because it’s quite conceivable that a 12-year old who plays three sports (and is thus diversified) spends MORE time doing his main sport (for example, tennis) than another 12-year old who only plays tennis. Who is more specialized then? So, for the rest of this discussion, I’m going to leave “specialization” behind and talk rather about what the data showed, and that is that delaying higher training volumes in the selected sports predicts eventual placement in the elite group. We need to discuss why that might be, because there are a few possible explanations. The other very important point to make is that all the data is an average (in this case, of 99 elite and 75 near-elite athletes) and within that data set, there’ll be large variations. So within the elite group represented by the beige line in the above graph, you may well have an individual who was doing 12 hours a week of training at 12, and you may also have near-elites doing less. So we forge ahead with a discussion recognizing that we generalize, but also realizing that the question is that if you took 100 children, what would you recommend in order to maximize the chances of producing best possible performances? I’d say there are three interesting questions about the changes over time in the two groups, which I’ve highlighted. Why do some children do more training from the age of 9 to 15? 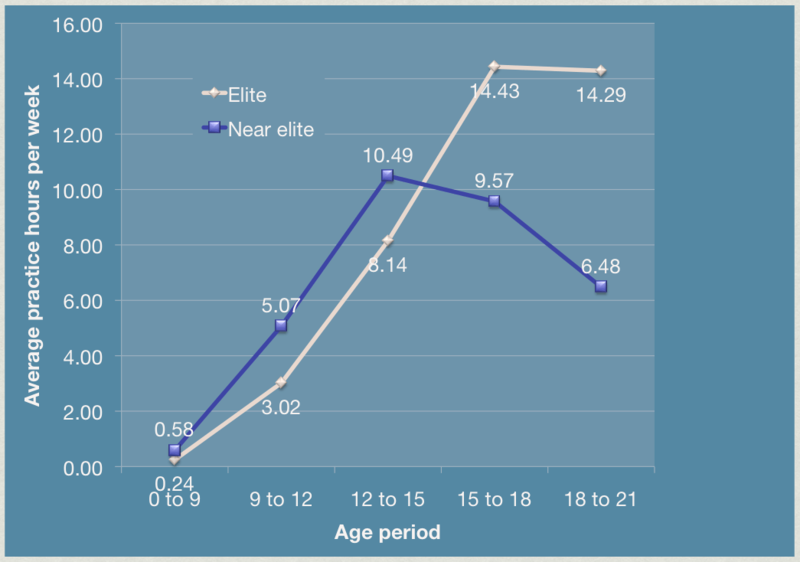 What happens in that period from 15 to 18, where there is a clear change in what the elite athletes do compared to those who will go on to become near-elite? Why do the elite athletes continue to maintain training volume while the near-elites decline further from 18 to 21? At the end of this post, I’ll come back to these three questions and summarize my answers. So if you feel like a “short-cut”, jump to the bottom and get the quick version! For the rest, to see the arguments, read on. Generally speaking, I would propose that there are two “models” that could answer all three questions at once. There’s a hybrid of the two somewhere in the middle, of course, but I’ll present the extremes in the interest of clarity. The two extremes are summarized below. I don’t have the definitive answer of which model BEST explains what was observed, but I will say upfront that I believe the answer to be a combination, but I’m leaning more towards the talent model, on the right, and I’ll explain why below. This model holds that young children who do high training volumes early will reach a point of burnout as a result of disillusionment with the sport, and a loss of desire which is amplified by a desire to try new things. Normally (but not always) the high training volumes early will be the result of over-enthusiastic parents, who do not necessarily intend to be this way, but who create pressure for a child to train and perform in the sport from very young. This may take the form of overt instructions (“you will train”) or more subtle cues which steer a compliant child down a focus that they might not have chosen themselves (this balance, incidentally, is enormously tricky, and it would be presumptuous of me to give advice on it, so I won’t…). There are without doubt parents who adopt the more driven approach (again, think Woods and Agassi), and it’s a problem here in SA, as I imagine it is wherever in the world you read this. Competition becomes the focus, the parent’s desire to win is transposed onto a child very early, and the relative importance of success is amplified. A coach then comes on board, perhaps with the same desire to achieve success (for the team, school or club) and this further amplifies the pressure for the young athlete. The consequence of all this is that at some point, the athlete turns away from the time required to train, perhaps finding other sports or stopping altogether. This explains point 2 and point 3 on the diagram above. I received an email from a well known SA champion runner yesterday echoing these thoughts, that the child may never have truly enjoyed the sport, but did it as a result of EXTERNAL motivation (normally parents, but also peers and coaches), which was not sustainable. It is certainly possible, as the examples some young athletes show us, but it’s the general explanation for why there may be such a high attrition rate in those who train high volumes at young ages. On the other hand, the elite athletes are those who are self-motivated, who have intrinsic desire to train, and this is motivation that normally develops later in life. These athletes sample sports when younger, play more and compete less, and restrain the degree of “structure” in their sport until later. Hence, training volumes are lower initially (1), increase later when the child makes the decision to commit and train hard (2) and maintains it as they achieve success (3). The parent, meanwhile, is probably active, but facilitate the child’s motivation, allowing them to develop at their own pace (again, thanks to Michael for the description!). In this regard, the psychology, or the loss of motivation, is the main driver for what is eventually seen as a physiological change – the athlete trains less, achieves relatively poorer results and thus seems, physiologically, to have worsened. So psychology drives behaviour (to train or not to train), which in turn drives the physiology (and performance). In contrast, the talent-physiology model says the exact opposite, that the physiology drives the psychology and the resultant behaviour. Performance is thus the ultimate consequence of physiology, not motivation. However, at around 15 or 16, these biological “gaps” start to narrow. Late developers start to catch up, independent of training and perhaps at this stage, the ‘end-result’ begins to take shape. The athletes who achieved success early on (thanks largely to early biological development) now find that their advantage is slowly being eroded. In other words, what is happening is that somewhere between the ages of 15 and 18, the “ceiling” comes into view. You may recall yesterday that I wrote that genetics likely determines the ceiling in performance. Training helps the athlete get there. It’s only at around 17 or 18 that it becomes more and more apparent to the athlete (and their coach and parents) that they have what it takes to succeed, or that they don’t quite have it. They may be good, and have achieved up to that point, but “great” lies beyond their capacity. As a result, their training volume declines (2). A loss of motivation? Absolutely, but it’s not the way the previous model defines it – here, the loss of motivation is simply because the athlete has recognized that there may not be a future in the sport. They love it, and still do it (which is why they still train), but why do 2 hours a day to finish 20th? At this point, the training history is irrelevant. Those who trained less when younger did so either because they had more natural ability and so trained less or for more sport, or because they developed later and remained out of competition. It doesn’t matter, because the decision from 18 onwards is made by a athlete who is responding to their performance ability. That accounts for Point 3 in the graph above. Also, it’s at this age that competition becomes fiercer, and so in order to remain competitive, an athlete must respond by increasing training volume, regardless of innate ability. Their natural talent takes them to that point with less training than their peers, and at the age of 16 or 17, when most children have matured physically, they can begin to see that they have a future in the sport and must increase training volume. Take a hypothetical case – a 15 year old rower, great as a junior because he is physically mature for his age. But by 16, his peers are catching him as they mature. They’ve been training less, but now their physiological development closes the gap on him. Then he starts to lose, not badly, but enough that he realizes that he doesn’t have what it takes. At this point, his motivation levels decline and he trains less, the gap between him and those later developers getting larger and larger. They have the added bonus that they have more “talent” to begin with, and pretty soon, you have this separation into the elite and near elite groups. I think this is a crucial part of the answer – the children who train more younger probably do so partly because of parental pressure, but also because of success early on. They do what they love, but they love it because they’re good at it! However, at some point, for various reasons, the status changes, and the later developers, who trained less early, start to excel and then choose to train more to find further success. So now you have a double-effect – not only do the most talented kids train more as they get older, but the less talented ones drop out and train less as they realize the ceiling is lower than initially thought. Ultimately, in this model, it’s the genetics, not the motivation, that “lets them down”, because they’ve reached their “ceiling”, which is set physiologically! In this regard, the psychology is actually “pre-ordained” by the physiology. So which is it? As I said upfront, I’m sure it’s both. In fact, there is evidence of reduced intrinsic motivation, and higher dropout rates, in athletes who specialize early with highly structured training. And there are without doubt young athletes who stop training because they lose motivation and become disillusioned. However, that doesn’t control for the possibility that it’s the physiology that actually determines the change in motivation over time, as I’ve suggested above. And so if I have to pick an extreme, at least given the data of the Danish paper and my own insights and experiences, I’d go with the Talent-Physiology model to explain the changes in training and ultimate performance levels reached in elite athletes. Why? A few reasons. First the training times in the Danish study up to the age of 15 are not really that high – an hour a day. It’s difficult to see that producing burnout, because it’s actually rather low. Three hours a day, that’s another story. So a “burnout” argument doesn’t convince me. Secondly, and more importantly, the decision to back off and train less happens too early for it to simply be burnout from training and loss of motivation and disillusionment. That would happen later, in my opinion, perhaps at school leaving age. I do think that motivation levels may decline, but the main reason I would propose for a loss of motivation in someone at that age is that they stop being as successful, and decide that the investment (training time) is not worth the return (coming third or fourth or tenth). And third, I don’t think that a loss of motivation solely due to too much structured training could account for such severe reductions in training time in athletes who are still succeeding (and these athletes are). I can think of very few athletes who retired from the sport while winning, and who did not return to it at some later stage. I can think of many athletes who were burned out only once they started to lose – not winning is a very powerful force that strips away motivation! So to see those changes at that young age (younger than 18), it would surprise me if it was a loss of intrinsic motivation as a result of too much structured training. As a result of losing (the talent-physiology model), yes, but not simply because too much practice was bad for them earlier on. So, three questions, and my three suggested explanations. Again, let me emphasize this as strongly as I can – both models are plausible. People lose motivation, and there’s evidence showing reduced intrinsic motivation. But that alone is not the driver of behaviour and less training, as I’ve argued. Doesn’t mean it doesn’t happen, it’s just that I would ascribe more cases to a talent-physiology model. So here is the summary for those who jumped ahead! They are either pushed by parents into training, or they choose to train in response to success in a given sport. That success might be driven by early physical development. Meanwhile, some children train and compete less because they’re late developers, or because they simply don’t need the same training volume in order to compete. Why do the elite athletes continue to maintain training volume while the near-elites decline further from 18 to 21?They respond to success – they recognize that the ceiling is high, and the fact that they’re now in a much more competitive environment necessitates more training. But that is worth it, because they have the capacity to succeed at the very high level. Their behaviour (more training) is the consequence of physiology. Obviously, there will be debate to this point. It contradicts what I perceive to be a general culture of saying to people that they can do whatever they wish to do, provided they train hard enough. Log the hours, you’ll earn the reward. Unfortunately, I don’t believe that sport works this way, particularly the cgs sports, because they are what I would call physiologically affected sports. All sports are physiologically affected, of course, but these are particularly determined by physiology. I think that the example of sprint athletes is the best I can think of to illustrate that speed is not as trainable as people sometimes suggest. But that’s for next time, when I’ll look at 10,000 hours, and the theory of training creating expertise. As always, this is meant as the first word in a discussion not the last, so feel free to comment!